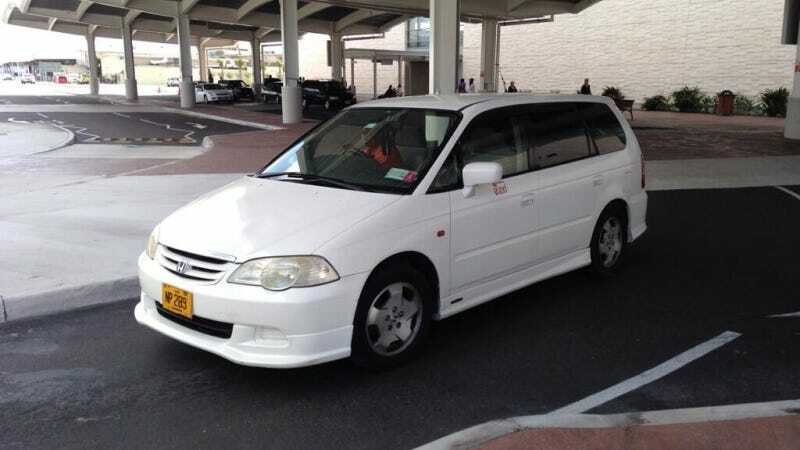 I spotted this mid-90's Honda Odyssey in the taxi stand of the Nassau airport and thought I might have discovered an uncelebrated Bahamian tuner minivan culture. But no, apparently the second generation Odyssey everywhere outside America kept conventional doors and got a little sporty. The first four-door Honda Odyssey was touted as a revolutionary entrant in the mid-90's minivan market with its small stature and car-style doors. True, it was the only minivan at the time to omit Huey-style sliders. But otherwise it was pretty much just a really tall Accord wagon. The idea of a Honda minivan was a hit, but not so much the original execution. Honda quickly conformed to the status-quo of sliding doors for the second iteration of their minivan. At least, they did in the US. As I just learned, and felt compelled to share, the Odyssey lived on an obese station wagon in other parts of the world. This global market Odyssey was aesthetically a facelifted first gen, but was available with a AWD and a manually shiftable automatic transmission called Honda S-Matic. That sounds like a tidy little people mover, and I'm not ashamed to admit that I dig this body kit. Am I nuts, or can anybody else get behind this?